The anticipatory bail crpc provides that a person who has reasonable belief that he may get arrested for a non-bailable offence then he may apply to sessions court or high court to get a direction for grant of anticipatory bail under section 438 of Code of Criminal Procedure. Criminal laws in India provides for the provision of anticipatory bail has been provided. Anticipatory bail is dealt under Section 438 of Code of Criminal Procedure (CrPC). Anticipatory bail means that if a person apprehends that somebody is moving to get him arrested then he can move either to sessions court or high court under section 438 of CrPC for grant of anticipatory bail in the event of his arrest and if the court may think fit it may grant anticipatory bail in event of such arrest. In India, the power to grant anticipatory bail has been provided to Supreme Court, High Court and Sessions Court. Bail means the temporary release of the accused from the custody of police either with or without surety i.e., either by entering into the bail bond or without a bail bond. To obtain bail the court may order to give some security in the form of cash, bond, or property. To know what is anticipatory bail, it can be said that as a concept in law, means an accused is granted release from custody fro officers of the law (the police) and into the custody of a person that is normally known to the accused as sureties. The words anticipatory bail has not been defined in the CrPC. The expression “anticipatory bail” is a misnomer and the order becomes operative only on an arrest. The anticipatory bail crpc provides that a person who has reasonable belief that he may get arrested for a non-bailable offence then he may apply to sessions court or the high court to get a direction for grant of anticipatory bail under section 438 of Code of Criminal Procedure. The possibility of the applicant to flee from justice, and. Where the accusation has been made with the object of injuring or humiliating the applicant by having him so arrested, Either reject the application forthwith or issue an interim order for the grant of anticipatory bail. Further, if the sessions court or the high court does not pass any interim order under section 438 of CrPC or does not grant the anticipatory bail then the police officer has the authority to arrest such person without a warrant on the basis of the accusation apprehended in such application. Anticipatory bail is required when a person is under the apprehension that he can be arrested for a non-bailable offence. For instance, if a person is married and his wife files a case under Section 498A of IPC then he is under the apprehension that he may be arrested thus, he can apply for anticipatory bail either before sessions court or high court. Code of Criminal Procedure in India provides for mainly two types of bail - Regular bail and Anticipatory Bail. The object of the arrest of accused is to secure his presence in the court during a trial but if the presence of accused can be secured in any other way than arrest then it is just an unfair to arrest such person as it will deprive the accused of his Right to liberty. 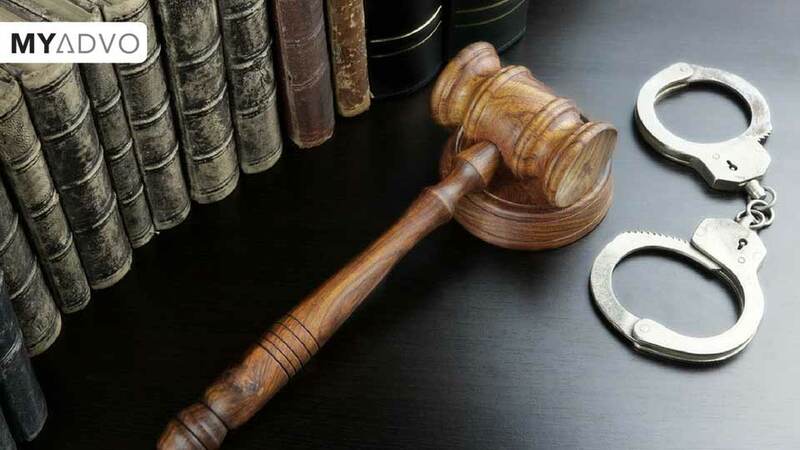 The provisions regarding the release of the accused person on bail - whether on regular bail or anticipatory bail are aimed at ensuring the presence of accused at his trial but without unreasonably and unjustifiably interfering with his liberty. The purpose of both types of bail - regular bail and anticipatory bail is simply to ensure that defendants will appear for trial and all pretrial hearings for which they must be present. In bail, a person applying for bail pay a set amount of money to obtain release from police custody. As part of the release, accused promise to appear in court at the scheduled date and time for trial. Anticipatory bail is applicable in the cases where the arrest has not been made by the police but the person is under the belief that he can be arrested by police for a non-bailable offence. Anticipatory bail is a direction given to release a person on bail even before the actual arrest. Anticipatory bail may be applied after having knowledge about a criminal complaint made against them to the police by someone, for instance, his wife, or by any threats made by her family against him and his family. It is also important to know whether, in cases where the FIR has been filed, the offence is bailable or non-bailable. While in the former bail in granting as a matter of right, the grant of bail in the latter is based on several contingencies. Application for anticipatory bail can be filed depending upon the kind of offence in accordance with the relevant provision of the CrPC. Section 436 provides that when any person other than a person accused of a non-bailable offences is arrested or detained without warrant by an officer in charge of a police station, or appears or is brought before a court, and is prepared at any time while in the custody of such officer or at any stage of the proceeding before such Court to give bail, such a person shall be released on bail. In such cases, a person should consult a top criminal lawyer who will help him in getting anticipatory bail. The lawyer will file a petition for anticipatory bail along with the vakalatnama before the appropriate court. After filing the petition a hearing is scheduled. Though the provision of Section 438 of Code of Criminal Procedure does not provide for sending of notice regarding the Public Prosecutor but the Supreme Court in the case of Gurbaksh Singh Sibbia vs. State of Punjab held that a notice should be issued to the Public Prosecutor or the Government advocate before passing a final order granting anticipatory bail. Therefore, if there are circumstances justifying ex parte interim order, the court may pass such order, issuing a notice to the Public Prosecutor by making it returnable and may pass a final order after hearing both the sides. Such other condition as may be imposed under Sub-Section (3) of section 437, as if the bail were granted under that section. When an FIR has been filed, the investigating officer will send a notice of arrest. As soon as the notice of arrest is received the person should file an application of anticipatory bail with the help of best criminal lawyers. The lawyer, in this case, will follow the above-stated procedure for grant of anticipatory bail. In such case, the Public Prosecutor will talk to the concerned police officer. Since no FIR has been filed it will be presumed by the public prosecutor and the court that are no grounds for granting of anticipatory bail. Thus, you will need the assistance of an experienced criminal lawyer for getting anticipatory bail. The lawyer will then make an oral prayer for seven days pre-arrest notice in case the police formulates an intention to arrest you/your family. In all likelihood, the judge will grant your plea. An order will be passed accordingly. This is called the ‘notice bail’ commonly. If the bail application is rejected in the Sessions Court, you could apply to the High Court. If the High Court also rejects the bail, you could apply to the Supreme Court. Section 439 of CrPC deals with cancellation of anticipatory bail. Though there is a specific provision in the code it is implicit that a court which has the power to grant the anticipatory is also empowered to cancel bail or recall the order related to bail upon appropriate consideration of facts. Anticipatory bail should not be abused in any manner as it is a special privilege given to a person who is under reasonable apprehension of his arrest. Even if there is no specific provision regarding the cancellation of anticipatory bail still the court has the power to cancel the bail owing to the inherent powers of the high court and it can be invoked under special or exceptional cases. The power to cancel the regular or anticipatory bail can be invoked only when court is satisfied that the ends of justice will be defeated unless the accused is committed to custody. MyAdvo acts as Client's legal concierge providing technology solutions for Lawyer Discovery, Price Discovery and Case updates. With the use of technological solutions, we match the client’s requirements with the lawyer based on expertise, location etc. Our dedicated team of 60+ in Delhi, Mumbai, and Bangalore strive to do everything to help the client in taking the better-informed decision by understanding his legal situation and requirement. Further, for any query regarding the operational or financial debtor, you can consult the Best lawyer online and also ask legal advice online. MyAdvo lets you find the lawyer anywhere in India online.